Truck drivers participating in a two-week fuel-efficiency rally achieved 10 mpg along normal routes on public roads, which is a far cry from the 6.4 mpg current national average. “We did 10 miles per gallon,” said Mike Roeth, executive director of the North American Council for Freight Efficiency, raising his arms triumphantly. The results announced Sunday unofficially kicked off the inaugural North American Commercial Vehicle Show in Atlanta. The event, dubbed Run On Less, aimed to showcase fuel-efficient features available to trucking companies that reduce fuel costs and greenhouse gas emissions. Collectively, the seven participating trucks achieved an average of 10.1 mpg. Not only did the double-digit results soar above the national average, they bested the 9-mpg goal set by event organizers. The participants included seven different trucking companies, ranging from national long-haul fleets such as PepsiCo Inc. and US Xpress Inc., to regional shippers like Albert Transport Inc. and Mesilla Valley Transportation. Three different vehicle manufacturers were represented, with the teams using a combined three International, two Freightliner and two Volvo trucks. If the efficiency demonstrated during the Run On Less rally became the national average, the trucking industry would save $24 billion and 9.7 billion gallons of diesel fuel annually, according to NACFE. The trucks used more than 80 fuel-efficient features, and included relatively low-tech ideas such as covered wheels, trailer aerodynamics and low-rolling resistance tires. Others included automated manual transmissions and natural gas. The exercise was not without setbacks. Hurricane Harvey shifted routes as trucks rushed into Houston with supplies. Hurricane Irma caused congested roads throughout Florida as residents evacuated in the days before the storm made landfall. Still, drivers were successful beyond expectations. The highest single-day fuel economy figure by a single driver was 12.8 mpg, and the truck that achieved the highest total average of 11 mpg also logged the most miles – more than 11,000. Onlookers were able to view live data streaming into RunOnLess.com as the trucks traversed the country. “These results are impressive and show what can be achieved with today’s available technologies, and what happens when you focus your efforts around getting total engagement from the entire stakeholder value chain,” said Scott Perry, chairman of NACFE and chief technology and procurement officer for Ryder System Inc. In total, Run On Less trucks traveled more than 50,000 miles on U.S. roads, pulling an average load of 55,500 pounds. The event was a true demonstration of efficient technology because it was conducted in the real world, with wind, traffic and more than 165,000 total feet of elevation gain, Roeth said. “I hope that it leads us to action,” he said. Run On Less can play a significant role in demonstrating to truck fleets, especially smaller ones with less money to spend on technology, that both efficiency and cost savings are possible, said Siddiq Khan, senior researcher for the heavy-duty vehicle program at the American Council for an Energy-Efficient Economy. “The technology is outpacing regulations to some extent,” Khan said. 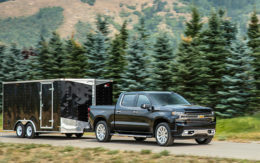 The features used in Run On Less can even compete with next-generation “super trucks” that utilize electrification and automated features, he said. Those trucks, made by major manufacturers such as Daimler and Freightliner in a Department of Energy program, are capable of an estimated 11 to 13 mpg. Run On Less was held against a backdrop of industry uncertainty. In 2016, the Environmental Protection Agency adopted new regulations for commercial trucks, buses and cargo vans to reduce greenhouse gas emissions called Phase 2. Despite widespread adoption, the EPA and National Highway Traffic Safety Administration in August reversed course and said a review of the standards will be conducted. 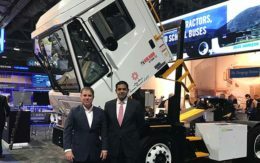 In April, Navistar vice president Steve Gilligan said the company will adhere to Phase 2 standards regardless during a presentation that included representatives from Daimler, Kenworth, Mack and Peterbilt. “Maintaining strong federal fuel efficiency and greenhouse gas emissions standards will ensure that fuel-saving, low-emission technologies will be widely deployed across the trucking sector,” Tonachel said. NACFE has been consulted by the EPA in developing regulations before, but shaping standards did not feature in the goals of Run On Less, Roethe said. Instead, NACFE will use the results from the project to advise trucking companies on how they can utilize cost-effective technology to save fuel and reduce emissions, said Yunsu Park, an automotive analyst who worked with NACFE on the event.